Stock photo of the tower and facades of buildings with windows illuminated with lights from the inside at Burg Ronneburg (Burgmuseum), Ronneburg Castle, during the medieval markets, Ronneburg, Hessen, Germany, Europe. Tower and facades of buildings with windows illuminated with lights from inside at Burg Ronneburg. 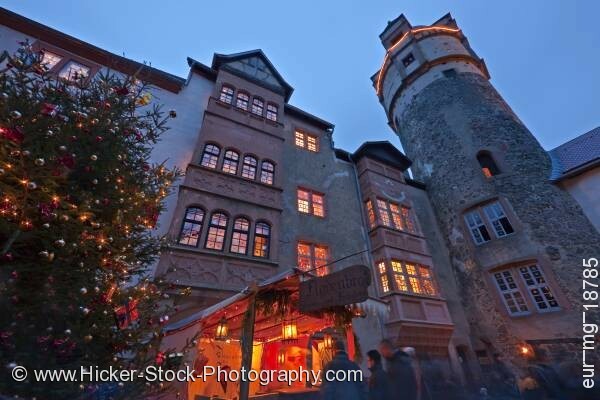 This stock photo shows a tower and facades of buildings with windows illuminated with lights from the inside at Burg Ronneburg (Burgmuseum), Ronneburg Castle, during the medieval markets, Ronneburg, Hessen, Germany, Europe. During an evening of the medieval markets, lights glow from the many windows of the Burg Ronneburg. One of the decorative facades have four arch windows on each floor. Another facade near the tower displays traditional square windows with a grid pattern. Under the windows of the facades are ornamental medallions. A ring of lights circle the top of the stone tower. Lanterns hang from a stall in the medieval market. A large Christmas tree is decorated in lights and ornaments sit to the left of the stall. Tower and facades of buildings with windows illuminated with lights from the inside at Burg Ronneburg (Burgmuseum), Ronneburg Castle, during the medieval markets, Ronneburg, Hessen, Germany, Europe.